If Skype Extras is creating an issue with software bloat through its games partner, Easybits, why do I get a blank Skype Extras window from the Tools | Get Skype Extras menu in Skype for Windows 5.3? In one of its previous lives, ca. 2006, Skype introduced a Partner program where they encouraged third party developers to innovate products around the use of Skype. These products arrived in the form of games, productivity tools, hosted business services and utilities that enhanced the Skype experience or incorporated Skype for its real time communications features. At the time Skype provided API tools that facilitated development of these products; they remain available even as Skype ramps up its SkypeKit developer platform. Products were made readily available to Skype for Windows users through the Tools | Skype Extras menu of the Skype client. One partner had over 3 million downloads between January 2009 and August 2010; a very significant number have become ongoing subscription-paying customers. During the summer of 2007 Skype held a Mashup Competition with regional and worldwide winners. PamFax, still in its infancy but sending faxes from a PamFax window, won the worldwide competition. (Watch Voice On The Web for a complete update on PamFax’s evolution to a one-stop multi-platform “Fax for business” solution in the next few days). Some the Extras publishers were acquired; for instance IBM’s Lotus Sametime division acquired the popular desktop sharing utility, Unyte. Others went away due to either a lack of market acceptance, a failed business model or impatient investors. And there were many issues with the level of support provided by the Skype Developer program at that time. 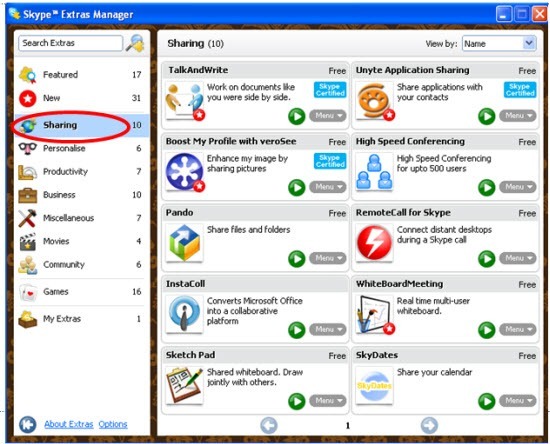 Skype announced the end of the Skype Extras program in late August 2009, pointing out that no new Extras would be accepted from that point forward and that Skype Extras would not be accessible from the Skype for Windows menu after August 31, 2010. However, while this menu is still available from the Skype for Windows 5.3 client, I get the blank window shown above. However they can still be found available on the Skype website: Skype Extras page and on the Skype Store. So what puzzles me is the recent appearance of stories about an additional program, easybits.exe, being installed with Skype for Windows. 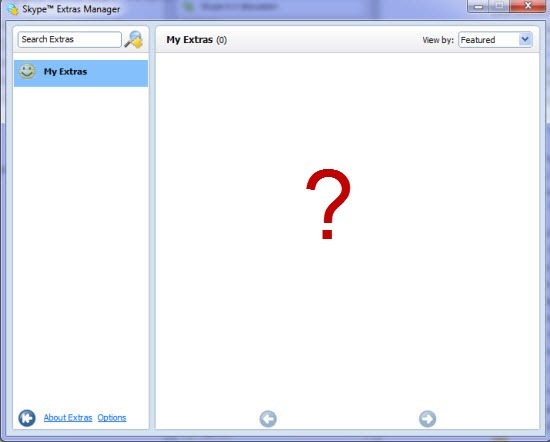 Easybits provided the platform for the Skype Extras games; it seems that a recent update to Easybits inadvertently got into some users’ recent installations of Skype for Windows. Looking through my Task Manager, there are no traces of easybits.exe; the only item related to Skype Extras Manager is skypePM.exe and it’s not consuming much RAM. Phil Wolff, over at Skype Journal, has more to say on this, including Easybits response, in #Skype Extras partner EasyBits releases game uninstall tool. Bottom Line: So my real question is, given the blank Skype Extras screen I receive as shown above (and have received for some time now), the lack of any trace of EasyBits software on my Skype for Windows 5.3 installation and the announcement that Skype Extras would go away last fall, what is the real status of Skype Extras today? Or is it just quietly withering away? P.S. – many of the former Skype Extras publishers have continued to offer their software and even built additional products that use the Skype API’s. Within a few days I’ll provide an update on where you can find these products today and their evolution into even better offerings.